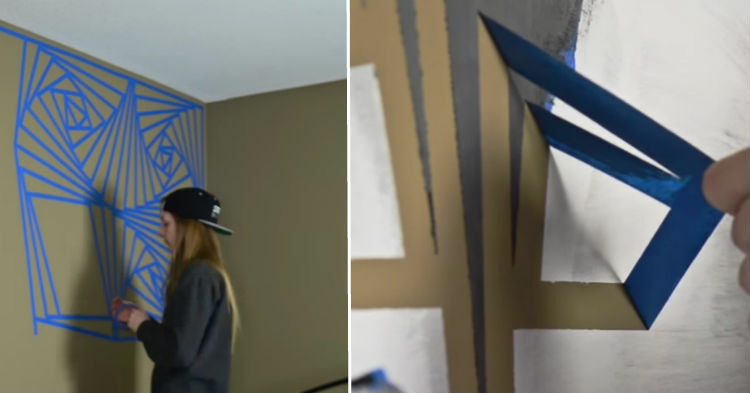 She Tapes A Strange Pattern On Her Wall Then Paints Over It. When She Removes The Tape? WOW! Inspired to make a change in her bedroom, YouTuber Elsa Rhae looked at the wall and knew that was wear she had to start. The brown color was disgusting and she really wanted it to be a place she and her husband could be proud to lay their heads at night. When you first see the finished product, it is easy to write this one off as “too hard” to try. But when you actually watch the tutorial it’s easy to see that anyone can do this with enough patience and follow through.